Seven years into defining my own Thanksgiving with my own family, and I think maybe, I am finally beginning to get it. As a young kid, I understood that we should be thankful for our food and family. We would attend large gatherings, and I remember once we even hosted one. At least 15 people were on their way to our house. My mom had been preparing the turkey and the sides. I was six years old, and she asked me to help with the salad. I took the bottle of Hidden Valley Ranch Dressing out of the refrigerator, saw that it was in the “New & Improved” plastic bottle, remembered the television advertisement in which they claimed the new bottle was unbreakable, and proceeded to demonstrate to my mother by throwing the bottle on the floor, certain it would bounce back. It didn’t. The plastic shattered. Ranch dressing was everywhere. As a teenager and young adult, Thanksgiving traditions became more variable. One year we would have Thanksgiving with Dad. The next with Mom. The next with Dad again. We might go out to an uncle’s for dinner, watch the guys chop firewood, and listen to guitar playing late into the night. Or we would visit Grandma and Grandpa’s and enjoy turkey and trimmings followed by scripture readings. We might have Thanksgiving at home with just Mom and the kids. And then, there was the year that Dad took us to Seattle and we celebrated Thanksgiving dining on East Indian cuisine. And as I grew into adulthood, Thanksgiving became more of a holiday to share with a special someone. The first Thanksgiving my husband and I were together, we celebrated the news that we would be expecting our first child. In time, we learned traveling with kids during the holidays usually ended up with someone getting sick in the end. We soon learned to recreate the holiday on our own. We tried to develop our own traditions. The one that seems to remain is the smoking of meats. Whether it be turkey, elk, antelope, or duck. Thanksgiving always seemed to lend the opportunity to share our knowledge and love for smoked meat. Through graduate school, we opened our home to others who might not be able to be with family. We supplied the meat and guests brought the side dishes. The unexpected outcome of this agreement was the variety of fantastic ethnic foods that showed up at the table. After all, the international students weren’t ones to travel home for an American holiday. Indonesian desserts such as buttered mochi and agar agar sat next to Estonian dishes such as pickled pumpkin and potatoes with meat gravy. Kimchi and sauerkraut might have easily found their way onto the same plate. No one left hungry, especially after making the trek in the bitter Wyoming cold to our professor’s house for dessert. In those years, I gained some of my first experiences with true friendship, as I shared my home, foods, and traditions with others. Many of the bonds I established in graduate school remain strong today. For that, I am thankful. After graduating and moving to North Dakota, we truly missed the way relationships had influenced our holiday. 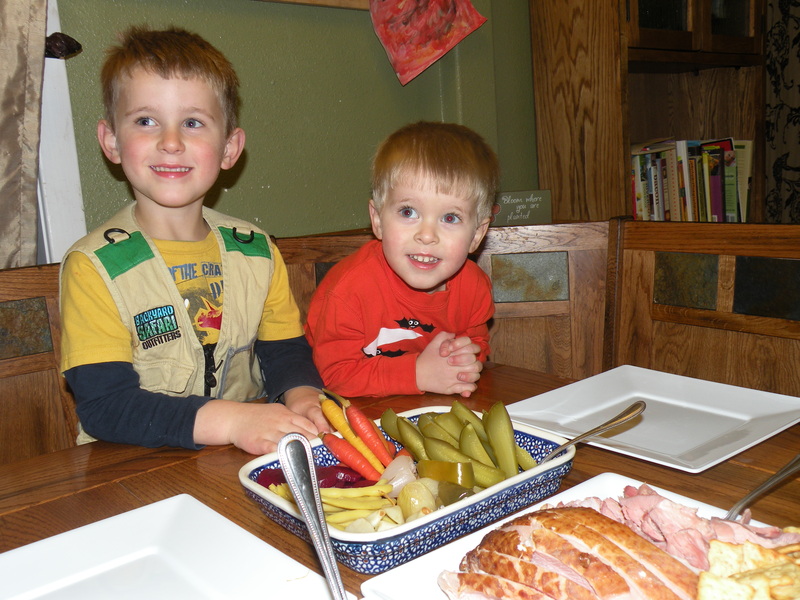 We enjoyed our Thanksgivings at home, trying different sides each year. Like squash risotto or sweet potato pie. We’d go around the table, sharing what we were thankful for. Just like we thought we should. Last year, I felt barely able to think about cooking. I was preoccupied by the loss of my dad. I couldn’t prepare or eat food without thinking of him. At times it felt like his presence in the kitchen with me was overwhelming to say the least. I did the best I could in writing about him and sharing his story. But the pain was still tremendous. We managed to have smoked turkey with cheese, crackers, and homemade pickles. It was simple and it worked. We were grateful, but something was amiss. This year is better. I feel more grounded and able to let the feeling of gratitude surpass that of grief. I am so grateful for our health. I am grateful for going gluten free and being able to enjoy eating again. I am grateful for so many friendships and professional relationships that have cultivated in the past year. Again, because I have been brave enough to share myself with others. And not just the parts I think they want me to share, but my true self. It was terrifying, because at a certain point, I realized I wasn’t independent. I couldn’t do it all on my own. My family wasn’t as independent as we thought. Even though we raised chickens and ducks this year and had an amazing garden… we continue to rely on others. Tonight we will enjoy smoked duck with a sauce made from buffalo berries. We raised the duck ourselves and harvested the berries at the beginning of October. The potatoes and onions we will roast have been in our root cellar since the last farmers market. As have the pumpkins and apples from which we will bake pie. We made the last harvest from our garden at the beginning of November when we picked the brussels sprouts and cabbages. We saved the brussels sprouts just for this occasion. Should the boys want a glass of milk or a dollop of whipped cream on their pie, we have that too, thanks to our cow-share. We will spend the day as a family. But we won’t be alone. The gratitude in our hearts is because of the interdependence with others. Those who shaped Thanksgivings years ago and those who helped shape this one by producing the food on our table. Without a doubt, we are blessed. Happy Thanksgiving from Pages of Paradigm. Posted in Appreciating the Moment and tagged family, holidays, interdependence, Local Foods, north dakota, relationships, story. Bookmark the permalink.